Finding the perfect golf bag to suit your needs can be a challenge. It might seem easy considering there are countless different models out there on the market – there has to be one that is perfect for you, right? Well, there probably is, but that bag can be hard to find. Traditionally, bags have been separated into two categories – cart bags and carry bags. Each had characteristics suited to its specific purpose, and the two really didn’t cross over. 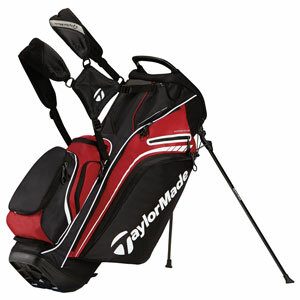 Now, with the TaylorMade 2015 Supreme Hybrid Stand Bag, you can have many of the features that are present in both styles of golf bag. This bag is one worth considering if you are a player who both walks and rides depending on the circumstances. If that sounds like you, the Supreme Hybrid Stand Bag will have just about everything that you are looking for in a golf bag. There are 14-way dividers at the top so that your clubs don’t clatter around too much while you are riding in the cart, but the bag also weighs just 5.3 pounds so it doesn’t wear you out when walking. Also, there are ten pockets that you can use to load up the bag with everything you need for those riding rounds. Of course, when walking, you will likely want to keep many of those pockets empty to save on weight. A golf bag is more important to someone who walks the course than it is to someone who rides. When riding in a cart, you usually strap your bag onto the back and pretty much forget about it until after the round is over. It’s a different story when walking, however. As a walker, you need your bag to function nicely and provide you with everything you need without making you work too hard at the same time. Features like double shoulder straps and quality stand legs might not seem like a big deal, but they are hugely important when it comes to enjoying yourself out on the course. The Supreme Hybrid Stand Bag has been designed to make sure that your needs are met properly when you do decide to walk 18 holes with your friends. The main concern that you will have when carting is that your bag is big enough to fit everything you want to take with you for the round. While this bag is not as large as some cart-only option, it has plenty of pockets and extra space for jackets, snacks, etc. If you can’t fit something inside of this bag that you would like to take with you during a round, there is a good chance you should just be putting it in the cart basket anyway. If you are a player who loves to both walk and ride depending on the course, be sure to check out the Supreme Hybrid Stand Bag for yourself. TaylorMade is no stranger to making exciting new drivers. In fact, TaylorMade typically takes more new drivers to market than any company in the game, and most of them are wildly successful. You will find plenty of TaylorMade clubs in the bags of the best players in the world, but it is their drivers specifically that usually capture the attention of the golfing public. With a variety of styles and designs to choose from, most golfers can find one club in the TaylorMade line that they love to hit. 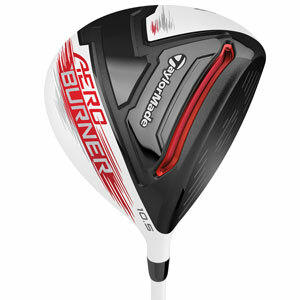 The AeroBurner driver is another in the long line of quality TaylorMade drivers. This one is a little bit unique by todays standards in that it doesn’t offer moveable weights or some of the other trendy functions that many of the new drivers feature. However, that doesn’t mean that it is light on technology. The ‘aero’ in AeroBurner refers the improved aerodynamic shape that TaylorMade has used for this club head. Despite still being a 460cc head, TaylorMade has tried to allow this club to cut through the air easier on the way down to the ball. Some of the changes that have been made on this club include a raised center crown designed to reduce drag, and a fin behind the hosel which is meant for the same purpose. Also, underneath the club is a ‘Speed Pocket’ which will help to increase the size of the sweet spot as well as lower the overall spin rate of the ball coming off the club. All of these innovations sound great on paper, but you will need to get out and hit the club for yourself to really see what it can do. Every golfer has their own unique swing, and only trial and error will tell you how a particular club will perform when put to the test. Many golfers think of hitting the ball a long way as being an act of power, but it is really an act of speed. It is speed which sends the ball flying hundreds of yards down the fairway, not raw power. You can’t muscle the golf ball off the tee and expect to hit it three hundred yards – you need to make a fast golf swing which tears through the ball at impact. As long as your swing is fast at the bottom, nothing else really matters. Speed through impact will equal great distance time after time. If your goal is to add speed to your golf swing, the AeroBurner driver just might be something worth trying out for yourself. Despite not featuring some of the new bells and whistles of other drivers, this club has been engineered with the goal of helping you swing the club faster into the back of the ball. A test drive at your local golf shop should be all it takes to find out if this club is able to deliver on that promise. Putting is all about alignment. If you can get properly aligned with your target time after time on the greens, you are going to make more than your share of putts. Most amateur golfers think their stroke or a bad read is to blame for missing a putt, but often it is a simple case of bad alignment. Have you ever missed a straight putt when you were sure you made a good stroke? Most likely, you were lined up to the left or right of the hole to begin with and you never even knew it. To help golfers improve on this crucial area of putting, Cleveland has introduced the t2015 Smart Square Putters. This series of putters comes in a variety of head shapes, including mallets and blades, so you can pick the one that looks just right to your eye. The idea behind these putters is simple – there are two squares which are meant to be lined up with the ball at address. If you can line up the two squares with your ball and the target line that you have picked out, you can be confident that your alignment is correct. Of course, that doesn’t guarantee that you will make the putt, but you will be a big step closer to knocking the ball in the back of the hole. Most golfers will see the Smart Square putters and immediately be reminded of the Two Ball putters produced by Odyssey. Those putters have two circles that are meant to be aligned with the ball, rather than two squares. The different is subtle, but Cleveland claims that the squares will be more successful for alignment purposes (you will have to decide for yourself). Putters are a highly individual club – meaning that a putter which works great for a specific golfer might be terrible for another player. Before buying any putter, it is best to try it out for yourself. It is crucial to but the right length putter, no matter which model you decide is right for you. The Smart Square putters are offered in a variety of lengths, so have yourself fitted for a putter and then use those measurements to make your selection. You want to be able to bend out over the ball in a relaxed posture with your arms hanging freely from your shoulders. If you feel cramped over the ball, the putter is too long. If you have to bend over uncomfortably far, the putter is too short. Finding the right balance will help you putt your best. Will the Cleveland Smart Square putter help you make more putts? That is for you to decide. However, it is an interesting design that is certainly worthy of a closer look. Even if it doesn’t change anything about your stroke itself, simply aligning your club better with the target each time will allow you to make more putts – and that is the only thing that matters in the end. As you probably already know, there are tons of golf GPS products on the market today. You can pick from a variety of styles, functions, colors, price points, and more. If you have decided that you are going to use a GPS unit to get your yardages from now on, finding a quality unit on the market won’t be a problem. In fact, your biggest issue might be narrowing down your choices to a final winner. However, spending a couple hundred bucks on a golf GPS unit might not sound like all that much fun – or a great investment. After all, unless you get to play a lot of golf throughout the year, the cost of a $200+ GPS product is going to be hard to justify. But what if it did plenty of other things? That is exactly the idea behind the Garmin vivoactive GPS Watch. This is not a product focused specifically on golf, but rather, it is focused on bringing you many different functions which are powered by GPS technology. As a golfer, you certainly want to make sure this watch can help you put the right club in your hands. Rest assured, it has that part of the job taken care of nicely. Course maps are available for more than 38,000 golf courses across the globe, meaning there is a great chance that your favorite tracks are included in the library. You can measure shot distances, get yardages to the green, keep your score, and more. As far as golf GPS watch goes, this unit will do what you need and then some. Do you like to be active away from the course as well? The vivoactive watch will help you there, too. This product includes tracking for running, biking, walking, swimming, and more. Also, it can pair up with your smart phone to give you alerts when you have a call, text, email, etc. More than just a golf watch, this is a GPS product that can track an amazing number of things that you do on a daily basis. Fitness tracking is a trendy topic these days, and the Garmin vivoactive watch can help you monitor your activity to make sure you are keeping yourself in great shape for those upcoming rounds of golf. It makes sense to consider a product that will do more than just get you a yardage on the course. While that is a great feature, you can get even more bang for your buck if you buy something that functions when you aren’t out on the links as well. You might find that you like the watch so much that you end up wearing it on a daily basis regardless of whether or not golf is in your plans. Wearable technology is becoming more and more popular within the last few years. The developments in technology across the board, specifically in mobile devices, has made it more and more realistic to place pieces of technology on various parts of your body to study movement. While this development has plenty of serious scientific purposes, it also has more casual uses – like helping you improve your golf swing. 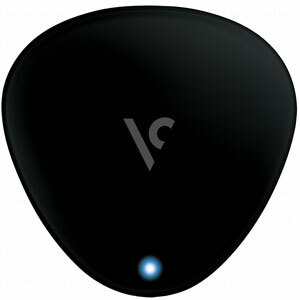 The Zepp Golf Swing Analyzer is a great example of just such a product. 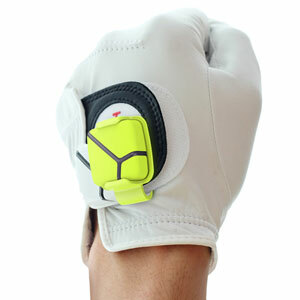 This small device clips onto the back of your golf glove and allows you to track a variety of statistics related to your golf swing. The information gathered by the device is sent to your smart phone where it can be analyzed in order to make corrections to your technique as soon as possible. You can set personal swing goals and chart your progress over time to see how you are improving your game. Often golfers will feel like they are making progress with their swing technique, but they won’t really have any way to tell for sure. That problem can be eliminated by using something like the Zepp sensor. With a plethora of swing information at your fingertips, you can make sure that your swing is getting better – and not worse – when you make changes intended to make you a better player. It would be a waste of time and energy to make changes that actually harmed your swing, so don’t allow that to happen. Take the step to track your swing using wearable technology and you can see for yourself how your game is changing. It is possible that you won’t know exactly what to do with the information that you glean from this device. However, a teaching pro will, so you could always take the data with you to a lesson with your local pro. Show them what the monitor is telling you, and then have them help you put together a practice plan to improve your swing. With the combination of technology and teaching experience on your side, better golf should be right around the corner. Many golfers fail to improve over time simply because they don’t know what they should be working on. You can eliminate that problem by acquiring all the information you will ever need through the Zepp Golf Swing Analyzer. Provide yourself with a clear picture of your current game and the path to a better game should quickly become easy to see. You probably don’t have your own personal caddie to tell you the yardage for each of your shots as you move around the course – that is a luxury that is usually only enjoyed by tour pros. 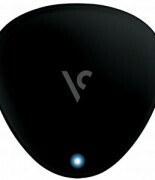 However, with the Voice Caddie VC300 Voice GPS, you can experience a similar service during your own rounds. This impressive new GPS device can provide you with audible yardages to the front, middle, and back of each green with just the swipe of a finger. Quick and easy to use, the Voice Caddie is an innovative way to receive the yardages that you need to hit great shots. 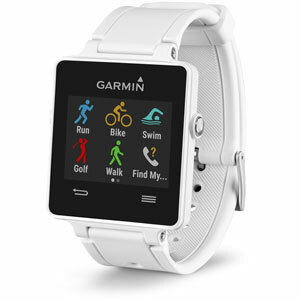 Most of the GPS units on the market today fall into two categories – handheld, or watches. Both of these can work nicely, and plenty of golfers are loyal to the units that they already own. The Voice Caddie VC300 falls into a new category, with a clip-on design that can be attached to a variety of places – including your hat. Since all you need to do in order to receive the yardage is swipe your finger across the surface of the device, you can place it wherever you find most convenient as you make your way around the course. With 30,000 courses already loaded onto the device, there is a great chance that your favorite courses are already included in the Voice Caddie VC300. That means all you will need to do is take it with you to the course, power it up, and get ready to tee off. It is designed to automatically recognize the course you are playing and the hole you are on, so there is nothing that you need to do in order to get started on your round. Getting your yardages should be as simple as possible, and that is the case with the VC300. Golf is a quiet game, so anything that makes noise is going to raise some eyebrows at first. With that in mind, the VC300 comes with seven different volume levels so you can choose the setting that is just right for your needs. When playing alone, you can leave the volume as high as you like to hear the yardages nice and clear. When playing in a group, you may choose to turn it down out of respect for your playing partners. No matter what volume you choose, you will love the simplicity of having the ability to listen to your yardages from anywhere on the course with just a quick swipe of a finger. Any golfer who enjoys walking the course as opposed to riding in a cart needs a great bag to help get them from the first tee to the last green. Walking the course is a great way to get exercise, enjoy the beauty of the course, and spend time talking with your playing partners. However, if you are trying to drag around a heavy bag with uncomfortable straps, the charms of walking the course may quickly wear off. Find a great stand bag like the TaylorMade Purelite and you might find yourself choosing to use a golf cart less than ever before. As the name would indicate, this is a lightweight carry bag that starts at just 5.5 pounds. Considering how many different items you may want to place in the bag prior to your round, having it start at a low weight is a great attribute. Also, the bag comes with a four-point strap which will allow you to find just the right position for the bag on your back so you don’t have to strain as you walk down the fairway. You want to keep your body fresh as late into the round as possible so you can keep your swing working properly – using a comfortable bag with a great strap is a step in that direction. 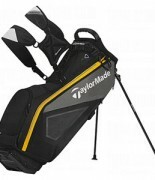 The TaylorMade Purelite includes seven pockets where you can hide golf balls, gloves, towels, snacks, or just about anything else you may need during your round of golf. Also included is an insulated cooler sleeve, as well as a removable ball pocket. While it is a bag that is meant for carrying around your favorite course, the base of the bag is also suitable for being placed on a cart for those rounds when you would rather ride. If there is one complaint that comes up more than all others with regard to carry bags it is that the legs will split too far apart from time to time. TaylorMade has solved that issue in the Purelite, however, by adding an anti-split system which is designed to prevent the legs from getting too wide as you set it down. Another feature that is helpful when setting the bag down, or moving it from place to place, is the molded handle that is placed at the top of the bag. If you don’t need to put the bag on your shoulders for a long walk, simply pick it up by the handle and move it to where it is needed. 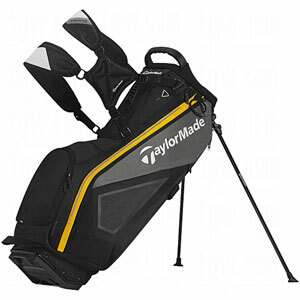 Convenience, comfort, and function are all words that accurately describe the TaylorMade Purelite Stand Bag.